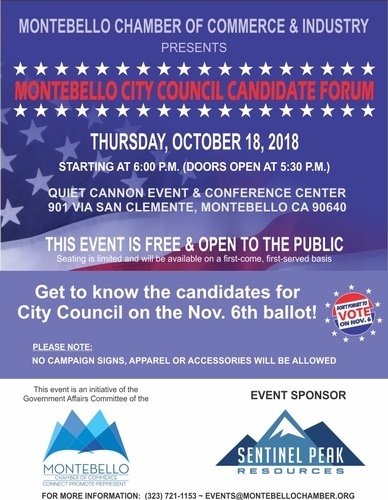 Get to know the candidates for Montebello City Council at a Candidate Forum to be held at Quiet Cannon on Oct. 18th! The event is free and open to the public. Doors open at 5:30 p.m. Seating is limited and available on a first-come, first-served basis. Please, no campaign signs, apparel or accessories will be allowed. This event is an initiative of the Government Affairs Committee of the Montebello Chamber of Commerce, and is made possible by the generous sponsorship of Sentinel Peak Resources.